So, it was one year ago this month that mi amiga Leslie and I headed into the kitchen to start our She Made, Ella Hace journey together. Over the past year we've made everything from Mole to Ponche Navideno, Sopa de Fideo to Atole. We've made tamales and cocktails and some chorizo may have even been made from scratch or baked into a mouthwatering loaf of bread and we've even made paletas. But the thing that we started with one year ago was one of my all-time favorite treats, Conchas. In honor of our one-year "anniversary", Leslie suggested that we head into la cocina and bake up some more Pan Dulce. You know, a nod to the thing that started it all. Hey, who am I to argue with reasoning like that? So I racked my brain trying to decide what I wanted to make this month. And I was still struggling at the halfway mark. I found an idea or two and then asked Leslie what she was making. Well, she said Chorreadas. I had no clue what those were, but when I heard queso and piloncillo, I knew I'd be smitten once I saw her post. I told her I still wasn't sure what I wanted to make, so she suggested Puerquitos. Puerquitos? 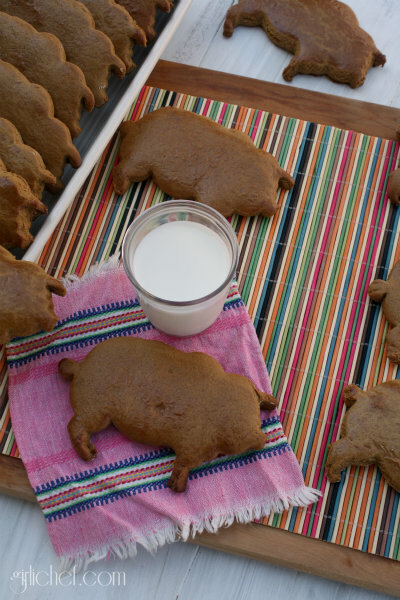 The only puerquitos I know are cookies. Cookies that I can't help but add to my tray when I'm carefully selecting bolillos and conchas and teleras (amongst other things) from the Panaderia shelves. 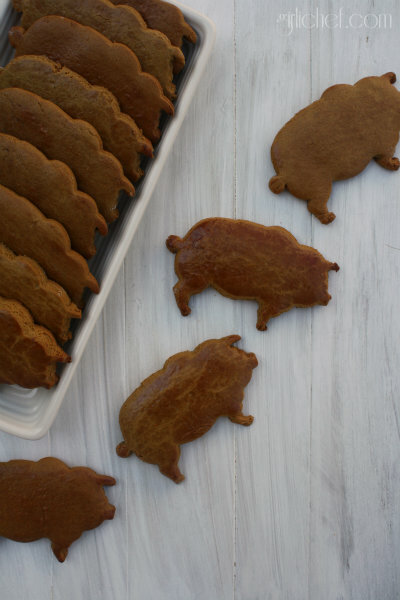 Little Big pig-shaped cookies dark with molasses and a hint of spice. Dense and filling, with a bit of a crackly glaze on the top. Those puerquitos? So Leslie told me that yes THOSE puerquitos, along with those other types of cookies that beckon my tongs from the Panaderia shelves are considered part of the Pan Dulce basket in Mexico. This would explain my hubby always grouped them together (I just never gave it much thought. Until I did.). So, it was decided. I not only wanted to make Puerquitos, I NEEDED to make Puerquitos. 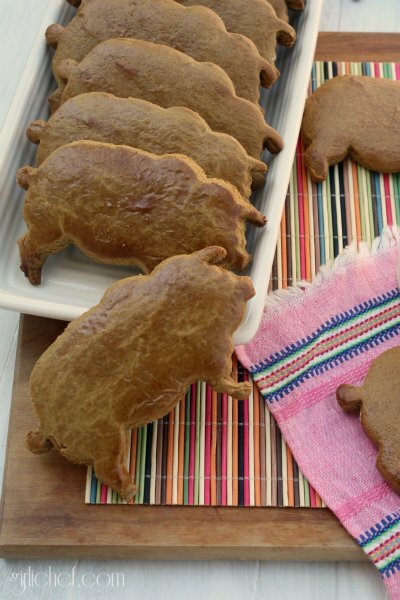 So ordered myself a little big piggy cutter and I made Puerquitos. At home. So, here they are. I hope you'll pop on over to see Leslie's Chorreadas next! And I hope you like what we bring you from our cocina's in the coming year. 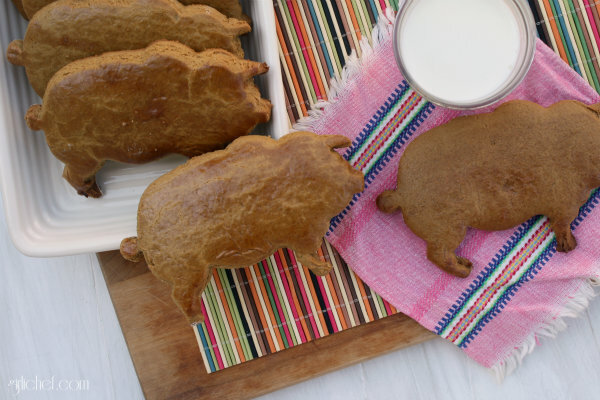 These soft, brown, pig-shaped cookies flavored with molasses and piloncillo are reminiscent of gingerbread are a traditional Mexican pan dulce. 1/4 cup butter or shortening, at room temp. 1 large egg, at room temp. Beat piloncillo and butter together in a large bowl until combined (they won't really cream together, just beat as best as you can). Add the egg, milk, and vanilla bean paste and beat again until smooth. Add baking soda, cinnamon, ginger, molasses, and honey. Beat until well combined. Beat in 4 cups of the flour. Gradually add the last 2 cups of flour, switching from mixer to a wooden spoon once the dough starts to become too stiff (so that you don't burn out your mixer). The dough will seem a bit crumbly, but once you've stirred in as much of the flour as you can, use your hands to quickly knead in the rest of the flour. You're looking for a dough that you're able to roll out. Lay a sheet of plastic wrap on the counter and turn the dough out onto it. Pull dough together into a large disc and wrap in plastic. Refrigerate for at least 1 hour. Preheat the oven to 350° F and line a couple of sheet trays with parchment paper or a silpat. Cut dough in half and wrap one half back in plastic wrap; set aside (or refrigerate for now). Roll other half of dough out on a lightly floured surface to about 1/4" thickness. 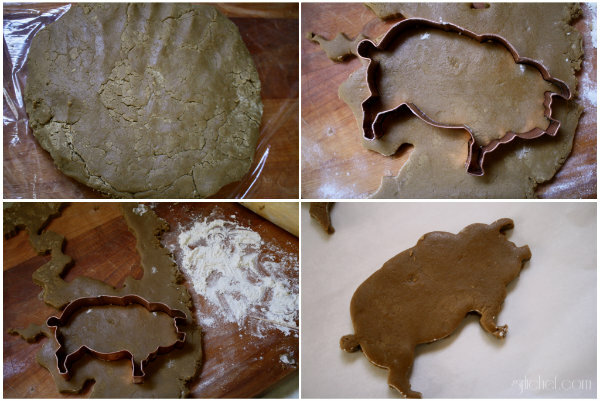 Use a large pig-shaped cookie cutter (dip in a bit of flour) to cut out pig-shaped cookies. Place on prepared baking sheet. Re-roll dough and repeat. Repeat with other half of dough when ready. Brush a thin coat of the beaten egg over the dough before you put it into the oven. Slide into preheated oven and bake for ~15 minutes or until cookies just start to turn golden around the edges and are just cooked through. My cookie cutter measures ~5 1/2" wide x ~4" tall. If you're cutter is larger or smaller, you may have to adjust the cooking time by a few minutes either way. I was able to fit 6 cookies per baking sheet. While one sheet was baking, I would prepare another. 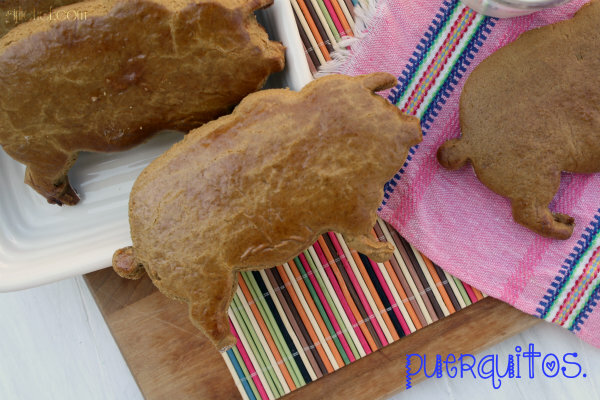 Puerquitos are a dense, almost dry type of cookies that are very filling and surprisingly not very sweet. They are great with coffee, hot chocolate, and/or milk. I even like them with orange juice.